Vlog Princess in France this September! Chers lecteurs français, I’m super happy to share with you that Vlog Princess – U.K. title: Royal Rebel – will be published in France this September – so, VERY, VERY SOON!!! I want to thank my French readers for writing me so many lovely messages, asking about when the next Fashion Detective book will be published…as of now I have no specific date for Fashion Detective book 4’s publication in France. That’s mostly due to the fact that my French publisher, Fleurus, has been working on the preparations for Vlog Princess’s launch in France this fall. So please keep following me for updates concerning Fashion Detective book 4 because I’ll let you know about any developments here on my website and on my Instagram and Facebook accounts. Thank you for being such awesome Fashion Detective readers! Your loyalty means a lot to me! The background will be holographic – something that you get a sense of in this picture – but, trust me, I’ve seen it in real life and I promise you it will take your breath away, like it did mine. It’s spectacular: holding the book is like clutching a handful of rainbow dust! Seriously! 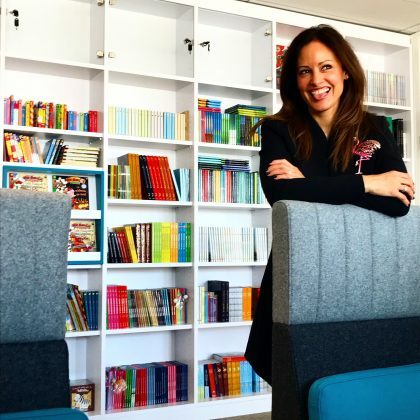 At my French publisher’s office, in April, discussing the launch of Vlog Princess. Very exciting!!! Also, exciting news: stay tuned because very soon I’ll be able to share the first chapter of Vlog Princess with you here! For now, though, I can tell you that my new series is about so many of my favourite things: girl power, ponies, vlogging, royal style, DIY fashion, dogs, friendship, palaces, feminism, history, glitter, princesses and queens, and, best of all, being true to yourself! I’ve had such an amazing time writing the first book of my new series, because I think these are things that interest all of us. 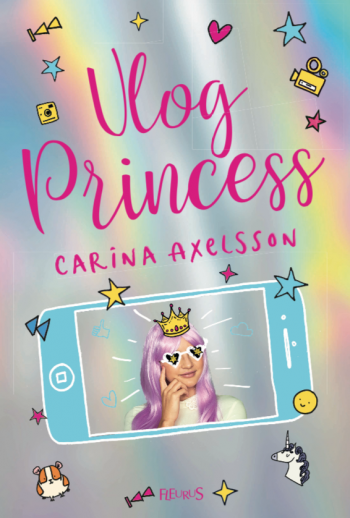 I can’t wait until you can read Vlog Princess and let me know what you think – although I know already now that once you read about Princess Lily, heir to the throne of Waldenburg – the world’s only queendom – and hear all about her secret DIY fashion vlog, you’ll want your very own passport to Waldenburg! Vlog Princess book 1 will be published in France at the end of September. I still don’t have a specific date, so, again, please stay tuned for more information. Till then I wish you une super vacances d’été, rempli de beaucoup de bons livres à lire!!! Lots of prestige for ‘vlog princess’ publishing in France first! So it’s going to go to a British library, for readers of French – both French and British. Learn early, have fun!